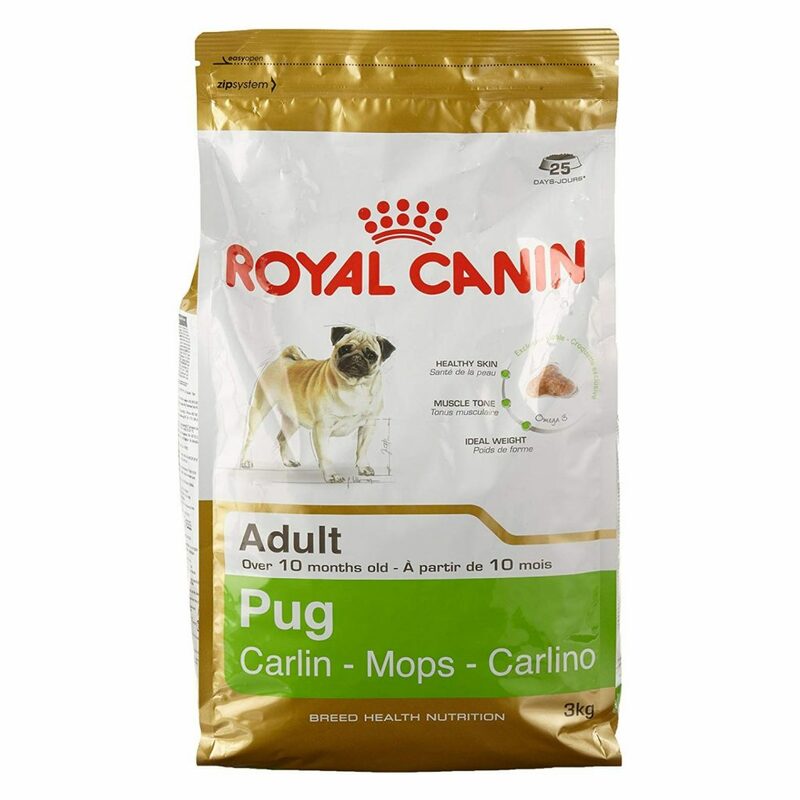 •	APT FOR ADULT PUGS- Royal Canin Adult Pug Dog Food is a diet ideal for the Pugs over 10 months. •	ENHANCES B1 STRUCTURE- This Dog Food is high in nutritional value that helps in enhancing B1 Structure that improves bone strength and promotes the healthy development of Adult Pugs. •	IMPROVES SKIN & COAT- The product contains ideal levels of EPA-DHA that helps in improving Skin and Coat of Pugs. •	MAINTAINS DENTAL HEALTH- The Product is a proven Kibble Technology that reduces the formation of tartar and maintains the dental health of Pugs. •	SUPPORTS IDEAL WEIGHT- This Pug diet contains L-carnitine and a moderate level of fat that helps in maintaining ideal weight. •	HIGH IN PROTEIN- Muscle T1 formula makes this diet rich in protein that helps in maintaining the Pug’s T1 muscles. 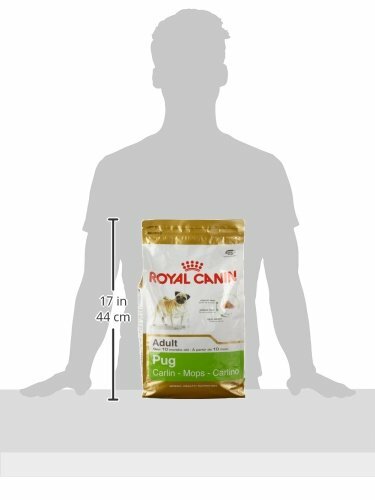 Royal Canin Adult Pug Dog Food is a diet designed especially for Pugs over 10 months of age. This diet is high in nutritional value that helps in enhancing the B1 Structure of the dog’s body that ultimately improves the bone strength and promotes the healthy development of Pugs. The Product is a proven Kibble Technology that reduces the formation of tartar and maintains the dental health of Pugs. This Pug diet contains L-carnitine and a moderate level of fat that helps in maintaining an ideal weight of them. 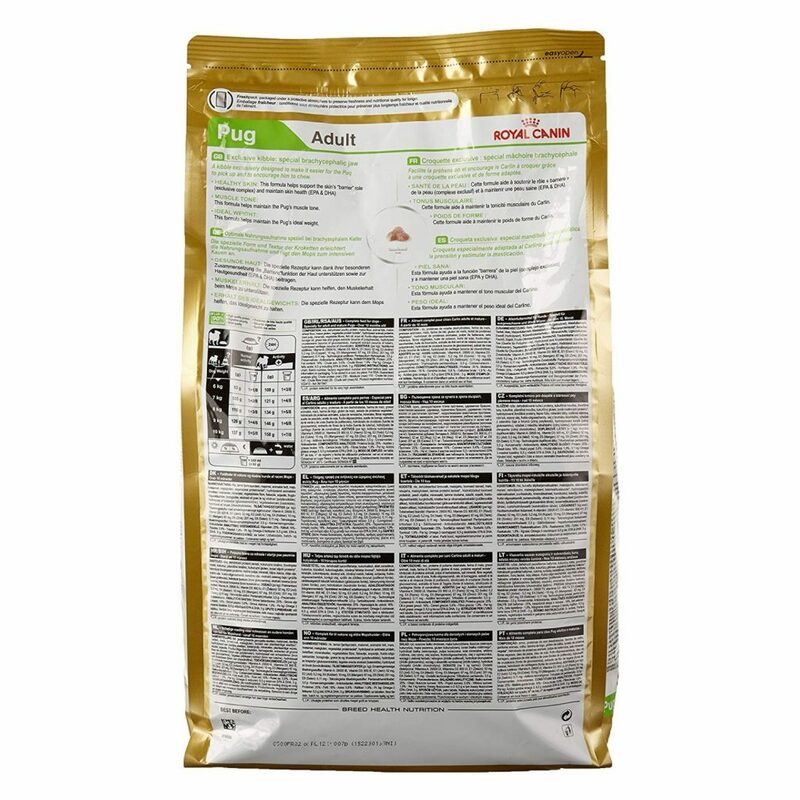 Along with this, the diet contains special Muscle T1 formula makes this diet rich in protein that helps in maintaining the Pug’s T1 muscles and promotes healthy development.